Recently inducted into The Musicians Hall of Fame in Nashville. Tennessee, (November 26, 2007) Don Peake is a multi-talented musician who has worked as a guitarist, arranger, record producer, and film music composer. He scored two Academy Award winning Short Films. Wes Craven’s “The People Under the Stairs”, which Don scored, opened as America’s # 1 Movie. 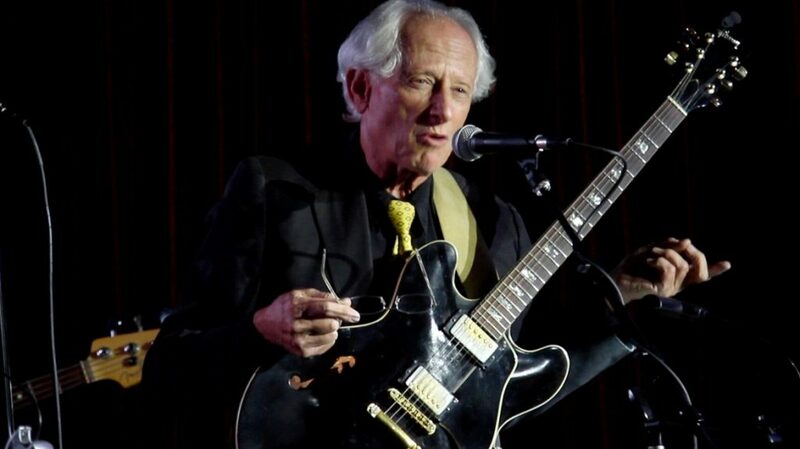 Starting his professional musical career as a guitarist in 1961, Peake’s talent was recognized early when he toured as lead guitarist with the Everly Brothers at the age of 21, playing in the U.S. and Europe for two years. Eric Clapton saw Don play, and he mentions Don in his new autobiography. Peake returned to Los Angeles to establish himself as a recording musician, and played for many of the legendary performers under Phil Spector’s production including The Righteous Brothers – “You’ve Lost That Loving Feeling”, Ike and Tina Turner – ” River Deep Mountain High”, as well as recording with Mahalia Jackson, Billy Preston, Cannonball Adderly, Marvin Gaye, and Diana Ross. 1964, Peake became the first white guitarist to play with the Ray Charles Orchestra, touring with Charles, and recording with him for ten years. Don was featured on Brother Ray’s “Let’s Go Get Stoned”, “America the Beautiful” “Crying Time”, and many others. During that time, Peake studied guitar with Barney Kessel, Howard Roberts, and Joe Pass, three legendary guitarists. Peake became one of the premiere session guitarists in Los Angeles, recording for Jan and Dean, The Mamas and the Papas, Sonny and Cher, The Beach Boys, and many others. Don was inducted into an elite group of musicians led by drummer Hal Blaine known as “The Wrecking Crew”. He played lead guitar for Marvin Gaye (Let’s Get It On), and on all the Jackson Five’s original hits, “ABC”, “I Want You Back”, Dancing Machine etc. Don was on the Commodores, Smokey Robinson, The Supremes, The Temptations, and many more Motown Artists’ records as a Staff Guitarist for Motown Records. Peake also played on John Lennon’s records that Phil Spector produced, and on all of Barry White’s hit records, some of which he arranged. On all of the records that Don Peake has made, he has been a major creative contributor. It was a natural thing for Peake then to move into arranging and composing. His first arrangement was Tim Hardin’s ” If I Were A Carpenter” for Bobby Darin, which sold over a million records in the first week and a half of its release. Peake has been involved in some of the landmark recordings of the last twenty years. Some of these have been “breakthrough” records, like his arrangements on Gloria Gaynor’s Platinum Album “Love Tracks”, the first disco record to become a pop crossover. His arrangement of “Don’t Take Away The Music” for Tavares was a runaway disco hit. Peake also has a Gold Album for his arrangements on Jermaine Jackson’s “Let’s Get Serious” album, and a Platinum Album for his production work with Ray Parker Jr. on ” Ghostbusters”. Don has arranged for Roy Orbison, Kenny Rankin, The Monkees (Gold Album), Minnie Riperton, The Fifth Dimension, Sonny and Cher, Wayne Newton (Gold Album), Hank Williams Jr. and many more. This amazing range of musical experience led Peake to composing music for film and commercials. He studied composition and orchestration extensively with Dr Albert Harris, Academy Award winning composer Paul Glass, and conducting with Broadway’s beloved Maestro Samuel Krachmalnick. Peake has composed the music for two Academy Award winning live action short films, “In The Region Of Ice”, and “Violet”. He also scored the short subject “Leon’s Case”, which won the Golden Hugo Award at the Chicago Film Festival. His film scores include Wes Craven’s cult classic “The Hills Have Eyes”, “Walk Proud” , “Moving Violation”, “Modern Love”, and “Breakin'” which earned him a Platinum Album. Peake has scored seven movies for television including “Dalton, Code Of Vengeance” and it’s sequel, and he has composed music for several pilots including “My Two Dads”. Don spent three and a half years scoring the popular Universal Television series “Knight Rider”. He also scored the American Playhouse production of “The Meeting”, a film about the meeting between Martin Luther King and Malcom X. Don won the Golden Addy Award in 1990 for Northern Natural Gas’ “Whistling Teakettles”, which was also chosen by Ad Week as one of the seven best commercials of the year. In September of 1991, Don scored the Universal Pictures release of Wes Craven’s “The People Under The Stairs”, which opened as America’s #1 movie. In addition to the sound track CD from “People”, Don has just completed his first solo album as an artist. It is a jazz album entitled “It’s About Time”, featuring Ray Pizzi and Mike Garson. Don produces Singer/Rapper M.C. Blvd and has a new release on Beckwood Records (Jan. 1998). Peake rejoined Ray Charles and performed with him and a symphony orchestra in L.A., Wichita, and San Francisco in April 1993 and three nights in April 1994 with the Big Band at Caesar’s Palace in Las Vegas, Nevada. Don has just recorded with Alicia Keys on “Back To Life” which is featured in Disney’s feature film “Queen of Katwe”. Don Peake served on the Board of Directors of the Society of Composers and Lyricists and he judged the “Arranging Category” for the Grammys for 3 years. He is a member of the Music Branch of the Academy of Motion Picture Arts and Sciences.